Ying and yang are concepts that have roots in Asian martial arts and metaphysics. Here in the West, we would say something like, "two sides of the same coin". One not only defines the other, but is dependent on it. This is especially true with aggression and passivity. Somebody once said that we wouldn't know what peace was if it weren't for war. War, then, defines peace. It is the absence of violence that creates the notion of non-violence. Musashi's version of conflict resolution was to simply behead whoever was standing in front of him, so when the warrior class in Japan came to an end in the nineteenth century, it was the beginning of a new era. The deadly art of kenjutsu (swordfighting), was replaced by kendo - the live blade being replaced by the user (and opponent!) -friendly bamboo shinai. Budo - the life-path of martial arts, became a socially acceptable course to warriorship that was, and is, devoted to ethics and good fellowship. The study of bu - warfare, simutaneously became the quest for the ultimate human value - peace. Thank you, John, for this wonderful weblog. It is filled with quality, great pictures, and wisdom. I have enjoyed reading through it. You have created something very uplifting, and supportive to training in the arts. I am very appreciative. I will continue to visit here. I would suggest that you look into the comments in the earlier blog entries. It seems that some "commercially" oriented people have left their marks.. selling tickets or such. Yep, lots of commercially intent people on those first entries. Thanks blogger, for word verification. I like your blog, it deals with fundemental questions in karate. Is it efficient? Are martial arts preparing you for a street battle? What were the original fundations of martial arts? Is the street brawler better than the black belt? Is there more than meet the eyes in martial arts? I like the thought that the absence of violence in non-violence. It's a great way to apply peace inside one's mind. Still, violence, anger, war are all in us. To strive for peace is to control those things, maybe clearing the mind of those things is the way. It's a life-long quest I guess. Hi John, Nice site! 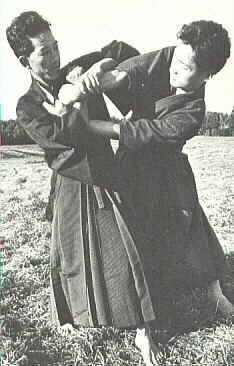 Although it's not an Aikido blog, I've decided to add you to my links. I used to shotokan karate and Kenpo before taking up Aikido. Thanks for your support! Aside from Mr. Estrada and Mr. Kientz, I haven't gotten a lot of feedback (or help) for my ambitious project - besides my best friend who also has a blog on blogger.com. I like your site; your commentary is poignant and concise without rambling on to make your point. And, your points are fairly congruent with the way I've thought about a few martial arts related topics as well.